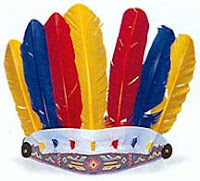 Our Native American class will make some great headdresses for our feast too. These are generally very easy and also can be varied according to how ornate you would like them. First, we used to take a piece of 12 x 18 construction paper and cut it into strips, but they were never quite long enough. You would actually need to take two of these strips and put them together. If you are doing it this way, after you have the strips together, allow the child to decorate the band as they wish. We have started to buy bulletin board trimmers with patterns that would correlate to American Indians. These strips are longer so you don't have to put two together. 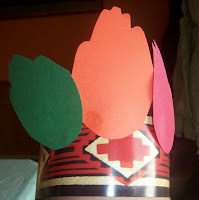 For feathers I trace the child's closed hand on different colored paper. If the child is good with scissors you can allow them to cut them out. After they are cut out, glue them to the headband. If you have some real feathers on hand these would look great too. Or, you don't even need feathers--it's your preference. Wrap the headband around the child's head to get the size, then staple together. My youngest son just likes to make these so he can wear them around the house. They are a simple addition to any dramatic play area.